The earliest local trace of ‘voices in the air’ arises when some local men returned from military service in The Great War of 1914-1918, and were known to initiate listening on Crystal Sets in the Harryville ‘Moat’. However, for our historical purposes, the formation of a Radio Club, is more closely related to the events of the Second World War 1939-1945, when Radio became central to the War. Though the earliest trace of local ‘civilian’ interest, apart from national Broadcasting on the BBC, was the issue of a British Receiving Station (BRS) License No. 7781 to M. G. Williamson, 13 Antrim Road, Ballymena. 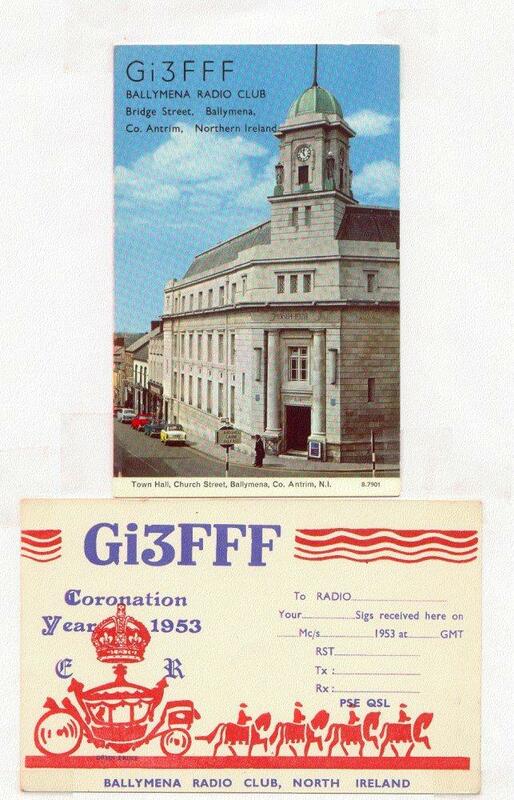 “Following a discussion between J. T. Greer, who owned a Radio and Electrical shop in Bridge Street, and a man called George Phillips, who came to Ballymena from Belfast during the War, and owned a drapery shop in Mill Street, just opposite the Town Hall, as to who was interested in short-wave ‘Radio’, ‘J. T’. replied that ‘I’ was the only local man that he was aware of, hence I was approached by George Phillips, when it was suggested that some local people, with a similar interest, should get together. Jim Stirling, the Chemist in Mill Street, Hugh Donaghy, the Chemist in Ballymoney Street, George Phillips and myself - from memory there were about ‘six’ of us, met in Phillip’s shop where we discussed ‘forming a Radio Club’, and ‘of course’ a cup of tea was provided. George Phillips left the town after the first year and he asked me to take over the books. An early decision was to purchase an 1155 ex. Government Aircraft Receiver, and an early consideration was a ‘Shack’ - a Club Room were members could meet and ‘learn’ from each other - John McIlroy, who had experience in submarines during the war and was proficient in Morse, was available to teach others. What little equipment I had was available for use. A hammer was purchased and timber to construct a bench. 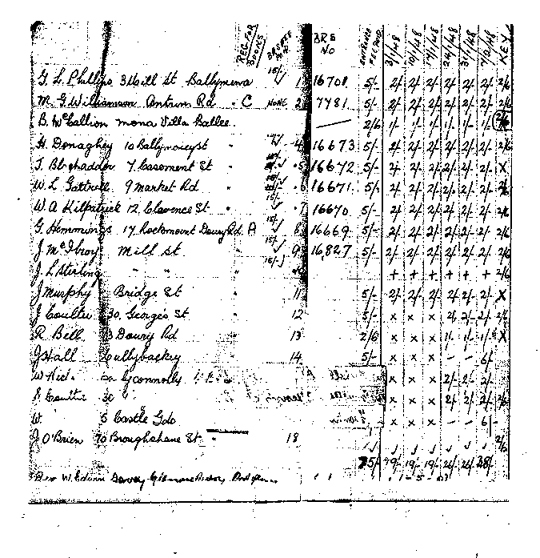 George Hemmings, who was employed in the Electric Company, got an electric pole and insulators. Bit by bit, pieces were gathered, and upon hearing of a shed in Davison’s yard, every effort was made to secure the premises as a workshop, operating room and toilet at 5/= per week. A pole was soon erected and wires strung up. Listening began, even during lunch hour Willie Davison and myself would make our way up to the shed. Eventually mention was made in the Belfast City Y.M.C.A. 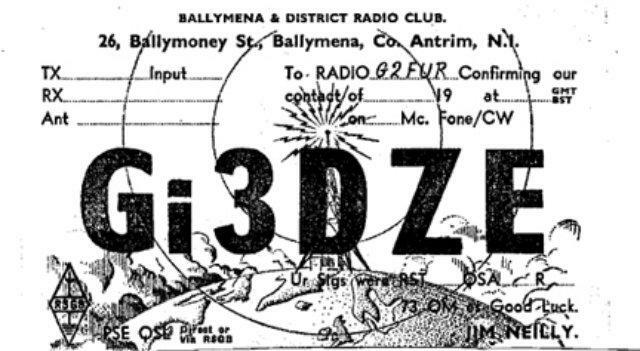 Radio Society, Gi6YM, that Ballymena had started a Radio Club and a volunteer was recruited to liaise. Eddie Beat Gi3 AV came down from Belfast every week-end to assist. The preparation was exciting and new, but not much was happening, and listening had limited interest. Receiving alone was not all that attractive, and this prompted the desire to advance to transmitting by acquiring a transmitter and making application to the R.S.G.B. for a call sign. In the meantime Eddie Beat used his own Call Sign until such time as an application could be made and a proper Amateur Licence obtained. The existing system continued - the 12 volt battery was placed on charge in Woodsides, picked up on Saturday and carried up to Ballymoney Street for twenty minutes operation on a 1154 transmitter out of a Lancaster bomber using a rotary generator. You can imagine the excitement when Gi3AV made a first contact OH (Finland). Of course this enthused further interest, and consideration must now be given to official registration, and Eddie Beat suggested that an application could be ‘speeded up’ if made in the name of someone who had wartime experience, and this prompted an inquiry among members and their friends. George Phillips spoke to the Editor of the Ballymena Observer (Mr. Neilly) who came up with the suggestion that his brother Jim, who had served in the RAF as a Wireless Operator might be the person to apply, and with his Operator’s Certificate, would in all probability be successful. but a mistake had been made - the application should have been made ‘on behalf of’’ rather than ‘in the name of’ a named person - James Neilly. Ballymena and District Radio Club was ‘on air’. Thereafter transferred to the Club Secretary, George McDowell and then to Jeffrey Clarke.